CDN Channel Elite Awards Recap: Big night for Zycom! Written by Zycom on October 3, 2017 . Posted in Blog, solutions. It was a big night for Zycom at the 2017 CDN Channel Elite Awards Gala on September 27, 2017 in Woodbridge, Ontario. We’re excited to announce that Zycom was recognized as finalists for our top projects completed in 2016. Zycom ended up taking home a Gold award in two categories and a Bronze award in another category. GOLD for Best Enterprise Solution. This award honours the solution provider that has created the most innovative problem-solving hardware, networking, mobile, cloud, big data or software-defined solution for an enterprise, defined as a company or department with 251 seats or more using the solution. This solution should include advanced technology products and software. This was awarded to us for our project work on a scientific research company looking to digitally transform their production data centre and DR colocation facility. Zycom came in with their services and project management team along with Nutanix solutions and consolidated the organization’s IT footprint in production from 313 rack units to 42 and reduced hydro consumption by over 50%. Using the built-in Nutanix WAN optimization for data replication, we were able to improve the disaster recovery optimization and eliminate multiple WAN acceleration appliances further reducing OPEX and maintenance by over $15,000 per year. Whilst the organization is not centered on revenue generation and more research, the cost reductions achieved through transforming their IT enable the client to reinvest in people to deliver more research innovation with improved performance and analytics for processing in a timelier fashion to support safety, security, health, environmental and clean energy technologies. 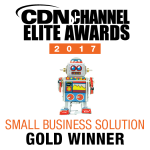 GOLD for Best Small Business Solution. This award honours the solution provider that has created the most innovative and problem-solving hardware, networking, mobile, cloud, big data or software-defined solution for an organization or department with up to 100 seats or less using the solution. Zycom through its digital transformation approach saved an Ontario Town 30% on its monthly IT management operating costs. Zycom was immediately tasked to develop a plan to upgrade systems to support the newest version of Vadim, improve data protection, and to enhance user productivity. Using a structured approach, Zycom rolled in their service desk, operations, project management and enterprise project delivery teams to assess the Town’s IT infrastructure. Huge shout out to our entire Managed Services team and project teams for making this one a GOLD winning solution! BRONZE for Best Mid-Market Solution. This award honours the solution provider that has created the most innovative and problem-solving hardware, networking, mobile, cloud, big data or software-defined solution for a mid-size organizations or department with 101 to 250 seats using the solution. Zycom provided KFL&A Public Health a Workforce transformation solution leveraging the Nutanix hyper-converged infrastructure (HCI) platform to reduce costs integrated with VMware Horizon View for the VDI broker, Mellanox for Top of Rack (ToR) networking with Zycom professional services. We effectively built a pre-production environment for KFL&A with the client not having to invest in any infrastructure for months until the business case had been approved internally. Once we received the necessary approvals we simply migrated the long term PoC environment onto procured production infrastructure in a few hours. Remote offices were a key consideration for moving to the VDI solution proposed by Zycom. With three remote offices of which some have internet bandwidth challenges, KFL&A needed to not only transform their service delivery but improve support and performance to remote staff. The Performance of the Nutanix platform and ease of Remote Access leveraging Horizon View with the PCoIP protocol was the answer. Needless to say, we are pretty excited right now to be recognized for our work in all three Canadian market segments. We’re on a digital transformation mission leading with companies like Nutanix, Dell EMC, Sureline Systems and VMware to name a few. All three of our projects that won us recognition, included our professional services or managed services involvement, ROI for the customers, and the Nutanix Cloud Ready platform as the core digital transformation solution. Learn more about our digital transformation or ITM Managed Support services.